Inventory We are a resale marketplace, not a box office or venue. Ticket prices may exceed face value. This site is not owned by Frank Erwin Center . 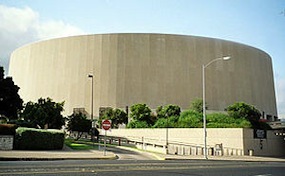 The Frank C. Erwin, Jr. Special Events Center, commonly known as Frank Erwin Center or UT Erwin Center, is a multi-purpose arena on the campus of The University of Texas at Austin. It is also sometimes referred to as "The Drum" or "The Superdrum", owing to its drum-like appearance from outside (not to be confused with Big Bertha, the large bass drum used by the University of Texas marching band). The facility is primarily the home court for the UT men's and women's basketball programs. Center-Austin.com is a privately held company that specializes in the sale of tickets in the secondary market. We are not affiliated with any official supplier or box office. Prices on our sites tend to be above face value and will change quickly with consumer demand. To purchase tickets to any Frank Erwin Center in Austin events simply call our operators at anytime or click on the event you wish to attend.